The innovative app allows the user to select from 51 festivals full of artists, to make their playlists. Using Last.fm's pools of data, you can browse through festival headliners to the un-established acts at each of the 51 festivals, before selecting your favourite three artists or the entire festival to populate a bespoke Spotify playlist or Last.fm radio channel. Once created, your playlists are permanently showcased on the app, giving users a sense of what is trending and what is popular, and you can share your playlists with your friends. Whilst there is also a competition to win tickets to your favourite festivals if you are still without a ticket! Spotify gives you on-demand access to over 18 million tracks, with a dream of making "all the world's music available instantly to everyone", with more than 10 million active users and 3 million paying subscribers in 13 different countries. Last.fm was founded in 2002 and is a service that intelligently reccomends users new music, personalised radio and concerts. It's 'scrobbling' service allows users to keep a record of what they listen to from over 600 music players, including mobile devices. Last.fm harnesses 60 billion pieces of music taste information to recommend music to almost 40 million users - so you can always find something you like. It is the first time that Spotify and Last.fm have worked together on a brand-led project and the final product is a finely polished application that link with each others applications flawlessly. With services that compliment each other, Chris Wistow (Commerical director at CBS interactive Music Group) commented, "it really highlights the synergy between the two services and the benefit this can have for music lovers." 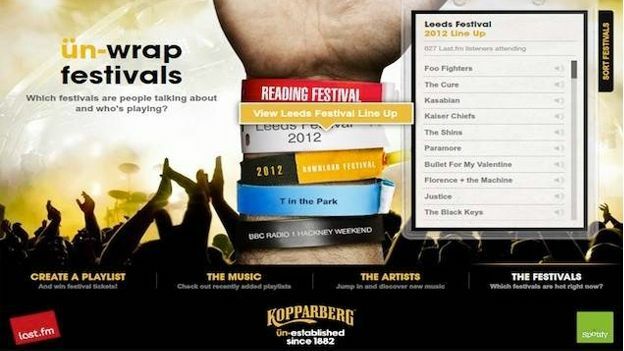 With Kopparberg masterminding this partnership, it aims to "elevate our contunued support of new music and festivals allows us to shine a spotlight on the talent of 2012". With over 51 festivals to choose from and countless artists performing at each one, there isn't any reason for you stop listening to your created playlists!